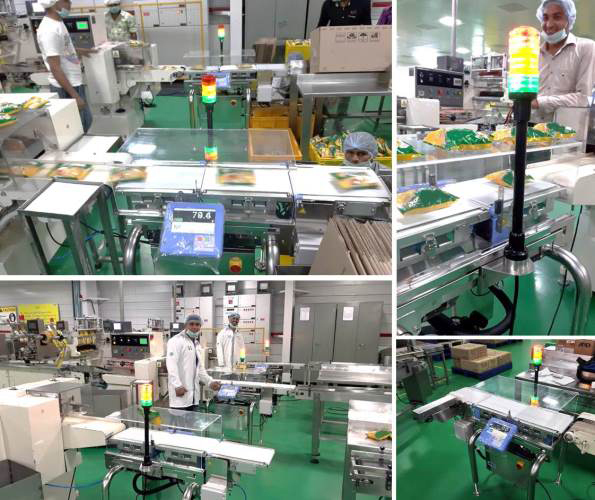 It took some time but we are starting to see progress in the sales of in-line checkweighers, metal detectors and x-ray food inspection systems. A&D Australasia, who made their 100th installation last year, were the lone player outside Japan until recently but now the situation is changing quickly. We now have a number of installations in the USA through the A&D Engineering Team who is quickly catching up with the Australian Team, and the Korean Team is right after them. Activities in Asian countries are also surfacing and we already have several happy customers in the Philippines and Indonesia. Our Indian Team has just sent us great news with some photos showing their installation. This is their third order and they installed 4 Checkweighers in one factory. They also sourced various components and attachments from local suppliers and responded fully to the needs of their customer.